What forward-moving purpose does Hip-Hop beef serve? Can someone please educate me? I was a little thrown aback by the recent beef that spread quickly throughout the Internet and radio shows involving Common and Drake. Frankly, I found it pretty weak for Common, an artist I respect, to engage in such nonsense. He supposedly took shots at Drake in his song “Sweet” from his newly released album The Dreamer, The Believer. I wasn’t impressed with the song; too much cursing. I wasn’t that impressed with the album either (I’m still listening to it though to see if my opinion will change). No, I’m not siding with Drake. I don’t even listen to him much at all. I got his album along with Nikki Minaj’s just to see what all the hype was about. They didn’t move me. I just think they are doing an excellent job of mastering their moment. Getting back to the eulogy for Hip-Hop Beef: I love Hip-Hop culture and trust me I've enjoyed true lyrical battles in our history but this mudslinging, name-calling, backbiting, buffoonery and randomly picking out other artists just for the heck of it has outlived its usefulness and has become a destructive force. The new trend now is grown men and women using Twitter to take shots instead of sitting down in person to solve our problems. I even read where Young Jeezy said one of his friends was killed due to an exchange of words on Twitter. When it comes to Hip-Hop, I always sit and wonder who calculates when a beef should start? Who should be targeted? How long it should last? What dirt should be unveiled? Do some artists start beef to make up for poor record sales? Are they thirsting that bad for publicity? Is their marketing and lyrical engine that weak that they need to start a beef to save their careers? If an artist has millions already, why waste time attacking people? Is it out of greed? Is there really a winner in a beef? Nobody in Hip-Hop can deny that The Honorable Minister Louis Farrakhan has been the most critical in putting an end to a lot of the beef in the genre. Back in 1997, Min. Farrakhan gathered a group of Hip-Hop artists at his home in Chicago to call a truce between East Coast and West Coast rappers. In attendance included Snoop Dogg, Ice Cube, Common (his name was Common Sense then), Tha Dogg Pound, Willie D, Fat Joe and more. In 2001, Min. Farrakhan was the keynote speaker at the Hip-Hop Summit in New York hosted by Russell Simmons. "Every time you use your rap song against another rapper and the magazines publish your words, the people that love you then turn on the people that you have spoken against. Then, the one you spoke against speaks back against you and his group becomes inflamed against you. When you are a rapper and you understand your leadership role, you must understand that, with leadership comes responsibility. You did not ask for it. It is imposed on you, but you now have to accept responsibility that you have never accepted," Min. Farrakhan said to the packed room. He added, "Your potential to change reality is so great that, if you learned the skill of words and how to use words; if you learned how to say what it is you want to say, but say it in a way that gains universal respect, then the rap would evolve to an art form that will never be replaced. It will evolve to be that form that will set the stage for the next phase of its evolution." In 2003, Min. Farrakhan sat down with Ja Rule in the midst of his heated feud with 50 Cent. In his conversation with Ja Rule, that aired on MTV and BET, Min. Farrakhan told Ja Rule not to give in to the pressure of his listeners who wanted him to keep dissing 50 Cent but rather "teach them that there's more to life than beef. "A war is about to come down on the rap community. When you and 50 throw down, it goes all the way down into the streets. The media takes the beef between you and 50 and they play it, they jam it, they keep it going. Why would they keep something going that could produce bloodshed? There is a bigger plot here, Ja, and this is what I want you and 50 and our hip-hop brothers and sisters to see," said Min. Farrakhan. Where would Hip-Hop be if they had fully implemented the guidance of this wise man? As for the beef, let's throw some dirt on the coffin and pay our last respects. Is over Serena Williams bruh. 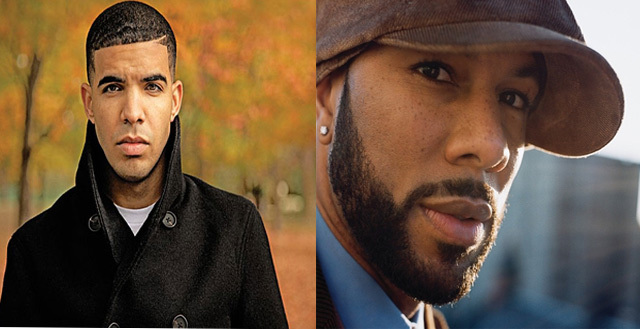 Drake made some statement while Common was dating her and Common is feeling a little salty. I am surprised as Common as well. and the Preacher says: "Amen" lol Just make I dont have to assist in carrying the big casket with the beef in it!!!!! Over Serena?! That makes it EVEN worse. Dudes who can have any woman they want fighting over ONE? Haaaaaaaaaaaaaaaa! I think we need to bury ENVY and JEALOUSY too in the same casket! When it comes to lyrical skills, Drake can't compete but unfortunately Common should just stick to acting because his skills not evolving. Drake got more years ahead of him...on another note, I didn't know Farrakhan did all of that in hip-hop. So underreported! Drake is a beast Brother Jesse. You need to listen to him a little more. But I agree the beef is uncalled for these days. It's really boring to me. After the JayZ/Nas one, which I think was plotted by them, there hasn't been any interesting lyrical bouts. Rap music as a whole has me yawning any way....fighting over Serena? LMAO!!!! Common disrespected Maya Angelou on the first song so I'm really disappointed in him. This beef needs to be thrown in the garbage can because its not worth the coffin expense...good article brother j. Being from Toronto, I see it differently. Drake lives, and grew up, in Forest Hill. Understand, if you're middle-class, you can't afford to live in Forest Hill. You gotta be super rich. (You also gotta know) he was the only Black guy on his street. What is Drake gonna tell me? - About the fight to survive the mean streets of Toronto?, or Doing what you gotta do to survive life in the "hood"??? Spare me the BS. With all the great rap talent one can find in Toronto's poor Black communities, why does it have to be the billionaire boy who gets to be the "rap star"? He's rich already. Just knowing the deal, Drake is the last person I want to hear rappin' about "scattering the N1gg3r's brains all over the corner." To hell with that stooge. Big up to Common Sense. He's been keepin' it real since forever. Dis'um again. I like competition, but it's rarely muture in hip-hop, sadly. If they were debating over styles and delivery (who did what first, etc. (See Luda/Drake)) I'd be fine. But talking about physically harming someone or even alluding to it is reckless. Honestly? How did an article on Hip Hop Beef become another way to trumpet the greatness of Faracon. That brother said nothing about the beef between the Nation and Malcolm X. All of you ppl are lame and dont know shi+ about rap. Beefing proves who the best rapper is hands down. All rappers do today is talk about being number one then when a beef starts you fans are like naw stop the beef its stupid....no let them dudes show us who the best rapper out there is. I appreciate/respect everyone's opinion on this article. its a shame. i really don't see either of them beefing, thought we were over that. Here's a video of Common last night in Miami, can't we just keep it smooth!